It’s 3 a.m. and Graciela Tito is turning heads on the dance floor with a spin move that makes her dress whirl — petticoats and all. The 25-year-old Bolivian maid wears pants to her night school classes but on weekends prefers to dress "cholita," donning the postcard-ready combo of bowler hat, shawl and layered skirt favored by Aymara Indian women in the Andean capital La Paz. (left) The costly cholita outfit makes a powerful statement of native pride, hardworking feminism and economic muscle. (below left) A cholita ensemble, jewelry included, runs $400 or more. It represents the indigenous woman’s seat at the center of La Paz’s economy. 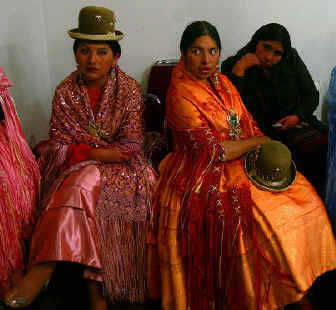 (below right) The Bolivian “cholita” style derived from Spanish colonizers is the daily dress of many older women in La Paz. But increasingly, young women--such as these contestants in the Miss Cholita 2007 beauty pageant--are celebrating a flashy urban update of the outfit. The seemingly anachronistic style, cribbed from the closets of La Paz's Spanish colonizers, is the daily dress of many of the city’s older women. 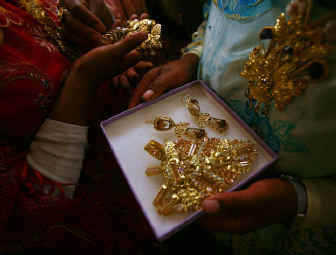 But a growing number of their daughters and granddaughters are celebrating a flashy urban update of the outfit. Their look makes a powerful -- and expensive -- statement of native pride, hardworking feminism and economic muscle. The rise of President Evo Morales, Bolivia's first indigenous president, has no doubt given cholita fashion a new cachet. But La Paz honed its urban indigenous style over generations of the same mass migration from countryside to city seen across Latin America. 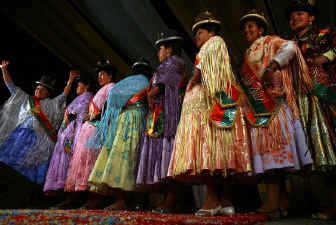 Cholitas, a term applied to indigenous women from across Bolivia, are now Congresswomen. One sits on Morales' cabinet, while another presides over the assembly rewriting Bolivia’s constitution. The costly cholita outfit -- Tito makes just $125 a month, but her full ensemble, jewelry included, runs $400 or more -- is also meant to show off the indigenous woman’s seat at the center of La Paz’s economy. Cholita-run stands sell every possible good on every city street. Cholitas cook the city’s food, clean its houses, bathe its children -- even swing pickaxes on its road crews. Cholita style represents "the urban Aymara woman, and the presence of the woman in the city, particularly in the economic sector," says Rosario Aguilar, the first cholita to win a seat on the La Paz City Council. Her own outfit radiates economic presence: a $350 imported Italian hat, a gold cross swinging from her charm bracelet as she answers her Motorola Razr flip phone. Cholita chic isn't welcome everywhere, however. Tito is still refused service in some upscale cafes and bars. Yet as the capital’s majority indigenous population awakens from centuries of discrimination, many now see the bowler hat and pollera as a heritage to be saluted, not scorned. Cholita: An indigenous woman from Bolivia. Hat: Impossibly small bowler, kept from falling by only a practiced nod of the head. Polleras: Cholitas’ patterned skirts, fashioned from silks bought over the Internet from China, Japan, the United States and elsewhere. They range in color from Easter egg pastels to screaming neons. Even petticoats are flecked with sparkling sequins. Shoes: No matter how cold the Andean winter, the women wear Spanish bullfighter’s flats cut from clear plastic.